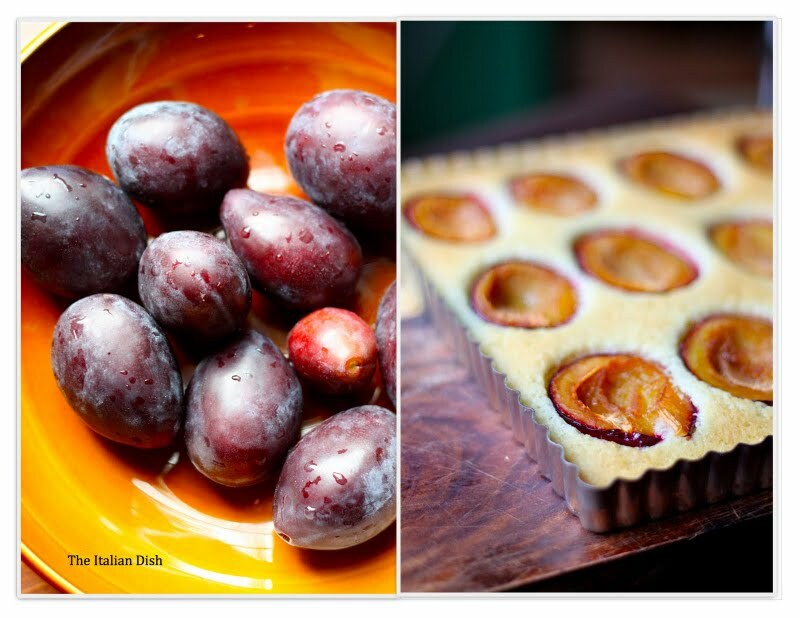 Last year at this time, when plums were in season, I posted a recipe for Chez Panisse's Plum Tart that people still e-mail me about. This year, for plum season, I wanted to share a recipe for an incredibly easy dessert that you can enjoy the next morning with your coffee. 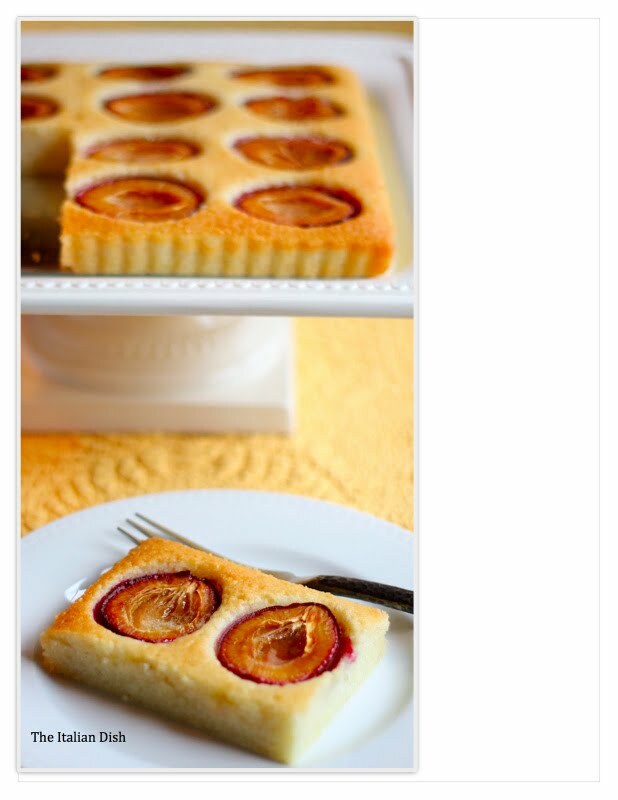 It's like a plum cake that takes only a few minutes to assemble and then bake. Since it only uses egg whites, I save my egg yolks and the next day I either make fresh pasta with them or some kind of delicious chocolate dessert that requires egg yolks. I made this dessert in a 9x9 tart pan with a removable bottom, but you can just make it in any small baking dish. Do not use something as large as a 9x13 baking pan. A 9x9 cake pan is fine. I used Stanley Plums, simply because they were at the Farmer's market. They are a nice plum but do not have a real depth of flavor like some others. Use whichever is your favorite plum for this recipe. I love this dessert because it is not overly sweet. Brian and I enjoyed it with a wonderful glass of Sokol Blosser white dessert wine that we picked up when we were in Oregon. It truly is "a glass of golden perfection" and it was heavenly with this cake. That's a stunning cake. I have some egg whites waiting to become macarons...maybe they won't, if I can find some plums! I love that plum tart and this cake. So much nice color AND, of course I like the idea of not too sweet. I recently made an ice cream with fresh plums and a little brandy and I've been in plum heaven. OMG Elaine! I love this - it looks so delicious. I am on the phone with my mom and she is obsessed too! Gorgeous cake! 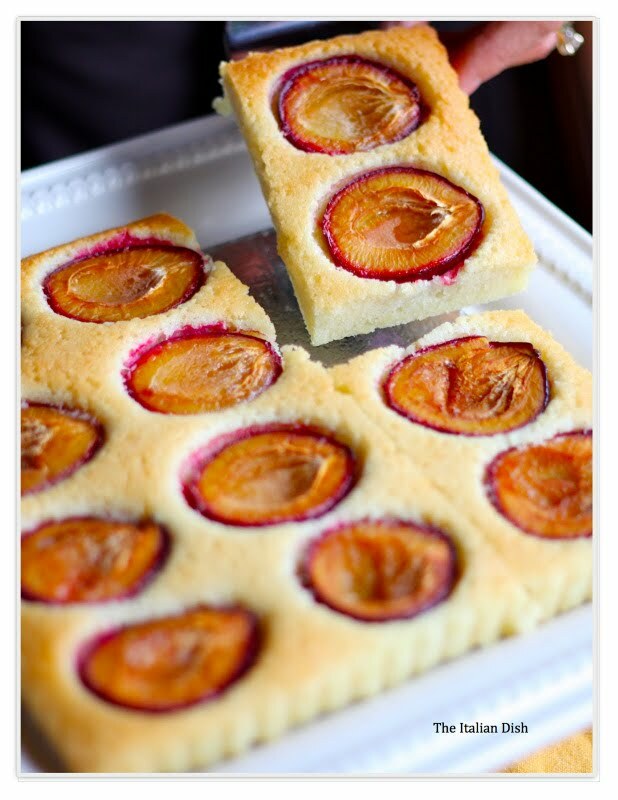 We have a plum tree so I am bookmarking this recipe right now! What a beautiful cake and a great idea for wine pairing! We're so glad you enjoy our White Riesling Dessert wine - we can't wait to try it with your gorgeous dish. Let us know if there is anything we can work with you on in the future! Fabio: Grazie! I fixed it! Yum!! Your pictures are just beautiful! ooh i am so excited i checked your site today!! i just bought a ton of plums from the market. cant wait to try it for friends this weekend. Elaine, This is almost to beautiful to eat, but cut me a piece, please! Should the egg whites be whipped to any kind of peak, or just frothy? This is beautiful and I can't wait to make it! Scottie: The egg whites do not have to be whipped into any kind of peak, just until they are frothy, for just a couple of minutes. Enjoy! I was scared to try this recipe because the end product looks so delicate, but it was very easy. WOW! Is this ever a gorgeous cake! I might give it a go in my new tart pan with a removable bottom. Thanks for the perfect recipe for my blue plums!